Lucas di Grassi finished on top of a disrupted and extended FP1 session in New York City, as visible clouds of dust and an overcast sky saw drivers sliding and crashing on the Brooklyn Street Circuit. 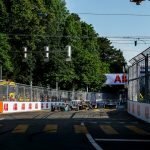 FP1 was the first potential session to show representative lap times here for this year – the circuit has been altered from last year’s inaugural New York E-Prix and extended by over 300m so last year’s times have been effectively mooted. However, with severely interrupted running due to red flags, it seems likely that times may fall even further as the day progresses. There was a small pile-up early on after Nick Heidfeld hit the wall at the hairpin, with Daniel Abt nudging into him and creating a classic Formula E traffic jam of no fewer than eight cars trapped around the corner. The session was briefly red-flagged to clear the track but quickly back underway with 35 minutes remaining. With 27 minutes to go, Jose Maria Lopez succumbed to the tight pit lane entry and ended up jammed in the Armco barrier at the entrance, causing a red flag that meant all other drivers had to manoeuvre around him to get back into the pits. At the time, Oliver Turvey topped the times with a 1:14.639s, however with the double red flags having stopped many drivers’ hot laps it was clear this was unlikely to stand for long if running was able to go uninterrupted. Dragon team boss Jay Penske confirmed that although the team weren’t sure specifically what had caused it, Lopez’ excursion in the barriers had caused something to shear in the rear suspension. When it was stranded on the track there had been visible leaning to the right at the back of the car, a clear sign of serious suspension damage. 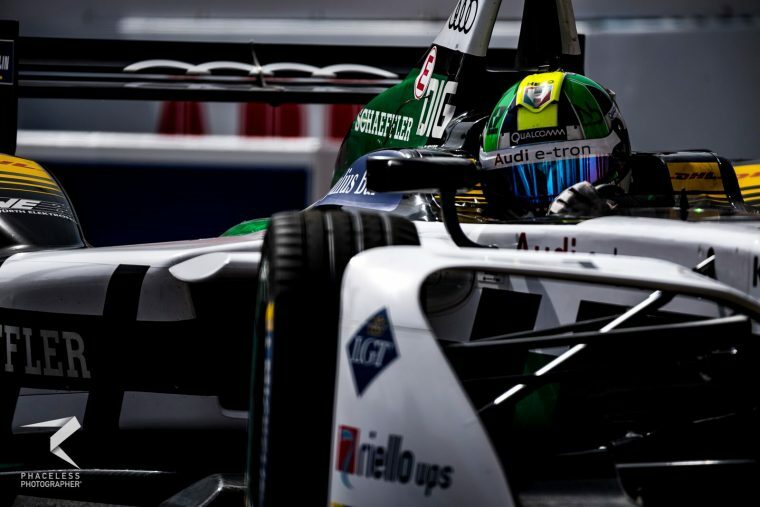 Because Formula E cars have complex regenerative braking systems in the rear suspension, major damage to it requires a full rebuild of the car – something the Dragon team are now facing in the hours before qualifying and the race. 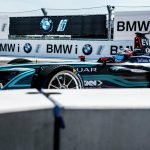 Formula E free practice sessions do not actually pause for red flags, so the over 18 minutes it took to return Lopez to the pits and clear the track to continue meant that when the green flag was shown there was less than 10 minutes remaining. Reflecting this, stewards opted to add an extra 10 minutes to the session’s overall time, to allow drivers to get reflective running on this new track. With time ticking down again, di Grassi set a 1:14.017s with just under ten and a half minutes to go, the first driver to get close to breaking the 1:14 mark. Meanwhile, home racers Andretti continued with a miserable season, pace-wise, foxed by the high-power straights now on this circuit to leave both drivers down in P17 and P19, Stephane Sarrazin’s best over 1.5 seconds off the lead time. Moving to full power in the last few minutes of the session, a familiar – although not to this season – pattern emerged as di Grassi and Sebastien Buemi topped the times, the only two drivers to dip below 1:14. di Grassi’s time stood tenths ahead, however, on a 1:13.566s to the Renault driver’s 1:13.916s. The Panasonic Jaguar Racing of Mitch Evans rounded out the FP1 podium. Maro Engel struck the wall shortly after, which yellow flagged an area around Turn 2 and essentially killed any hope of better times in this first running here but di Grassi’s lap certainly sets a benchmark for the rest of the day here.